A game by Interabang Entertainment for PC, Mac, PS4, and Xbox One, originally released in 2014, with the Smash Edition released in 2017. 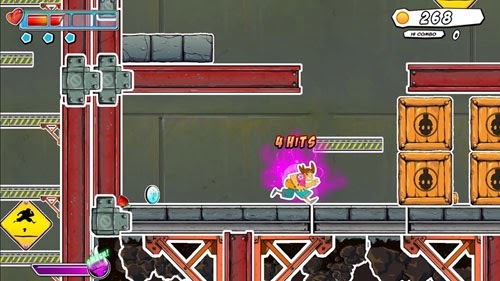 Super Comboman is a game about a fellow named Struggles who is enamored with his favorite manga hero, Super Comboman, so much so that his obsession intrudes into his day-to-day life. Everywhere he goes, he thinks he sees Super Comboman in the distance. When Struggles sets out to look for a job at a construction site, he finds himself overwhelmed with the desire to perform “combat training” by beating up everyone he encounters and breaking everything he sees. Struggles himself is a caricature of manga fanboyism; he’s overweight, has a mullet (specifically “mullet nuggets”), and sports a fanny pack. 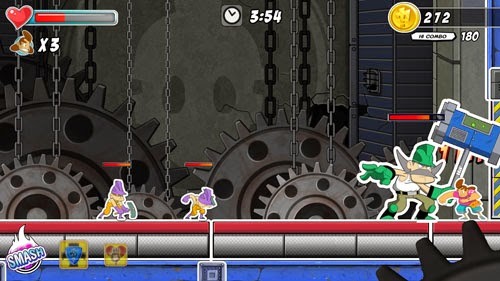 The game sets itself apart from other brawlers with its sticker presentation, featuring characters, enemies, and objects with white outlines, and some enemy animations feature stickers peeling or spinning. 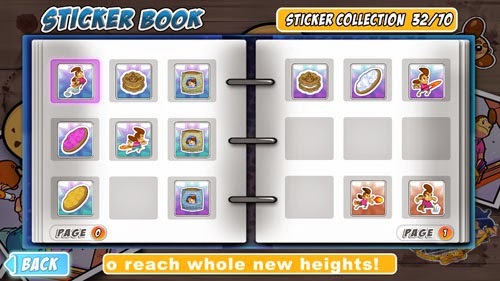 The player may also search the environment to find stickers, some of which open up new purchasable moves in the shop, with the others simply filling out a sticker book. 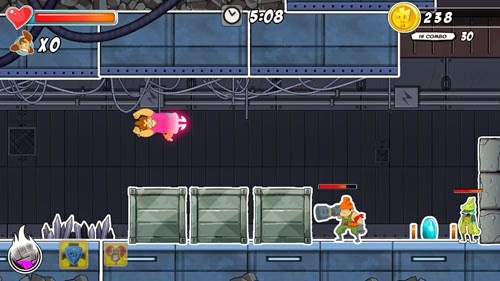 The game offers lighthearted humor and illustrated cutscenes, with an enthusiastic but hapless hero stumbling through unusual situations and larger-than-life set pieces. If the history of the beat ‘em up has taught us anything, it’s that building a good game in this genre is incredibly difficult. In the heyday of belt-scrolling standouts like Double Dragon and Final Fight, there were dozens and dozens of uninteresting and flawed brawlers that padded out the arcade-scape, many of them developed by major studios. It’s no surprise then that indie developers breaking into the brawler scene find themselves facing the same sorts of challenges, the biggest of which is how to go about building a game with a solid foundation that remains compelling from beginning to end. And Super Comboman is no exception. 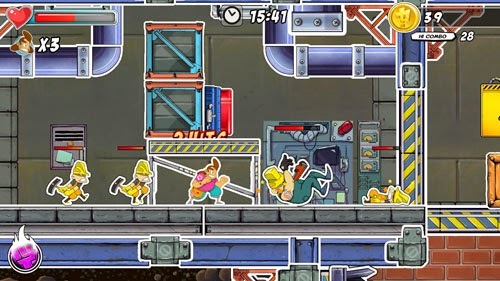 Unlike most beat ‘em ups that allow their pugilistic protagonists wander freely between the foreground and background, the action in Super Comboman takes place on a single plane, with enemies coming in directly from the left or right, or occasionally from above or below. 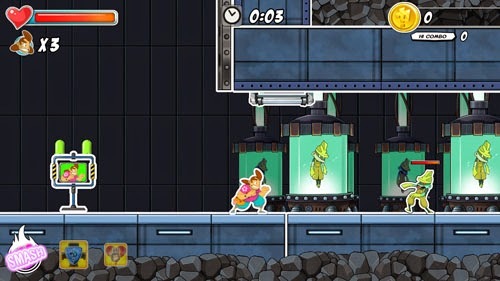 The game features large platforming environments that require players to move through horizontally- and vertically-oriented areas, as well as activate switches to open doors and destroy objects to reach hidden collectibles. To navigate these obstacles, Struggles has a 1.5x variable height jump and a 3x double jump. A dash move may be initiated by double-tapping forward to cross small gaps (and later to dash in the air with a purchased upgrade). 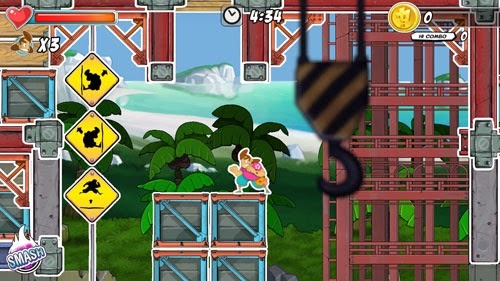 There are no ladders in place to reach higher platforms, but there are a number of narrow vertical shafts that require the player to wall jump slowly upward in order to ascend. Unfortunately, the game commits the sin of mapping the wall jump maneuver to BACK and JUMP rather than FORWARD and JUMP. Jumping toward a wall and attempting to jump away quickly may result in Struggles altering his midair trajectory to move away from the wall and fall back down to the bottom. This leads to some frustrating sequences while the player attempts to learn the proper timing for a continuous ascent, and it becomes particularly troublesome when the player needs to make a number of these wall jumps in rapid succession. With no wall slide or wall grab, it is difficult to tell whether a just-within-reach wall is truly accessible, leaving sticker-hunting players to fling themselves into walls repeatedly in hopes that they nail the timing. 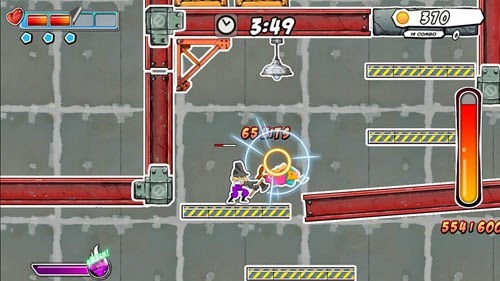 Struggles has what appears to be a standard brawler moveset, with a light and heavy attack, and a number of direction-specific strikes, such as an uppercut, backfist, and downward punch, as well as aerial attacks. 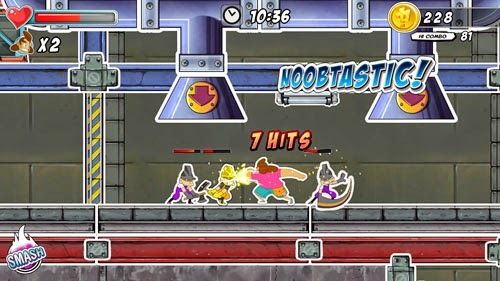 With this set of moves, it is possible to punch an enemy into the air and juggle him, drop down and strike an enemy below, or knock an enemy back into an object or another enemy to cause additional damage. Most games that feature a light and heavy attack are built around alternating between these two types of attacks to string together different types of combos, but that is not the case here. In Super Comboman, your heavy attack is assigned to a meter that must recharge after each use. So, you may lay in a 1-2-3 punch with your light attack and then unleash a heavy attack to knock your opponent backwards, but if you repeat this sequence immediately thereafter, the heavy attack will fail because your meter hasn’t fully recharged. The meter does refill quickly, but not so quickly that you can rely on it for every enemy exchange. 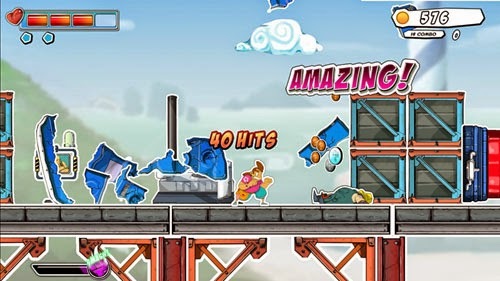 Furthermore, the game features a number of destructible objects, such as wooden crates that drop coins and/or health restoratives, as well as brick walls, metal crates, and other heavy objects that must be cleared out of the way in order to proceed. Weaker objects are affected by your light and heavy attacks. 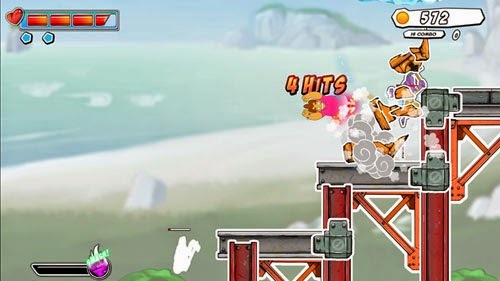 However, stronger objects may only be destroyed with multiple heavy attacks, leaving the player to attack, wait, and attack again in order to move forward. 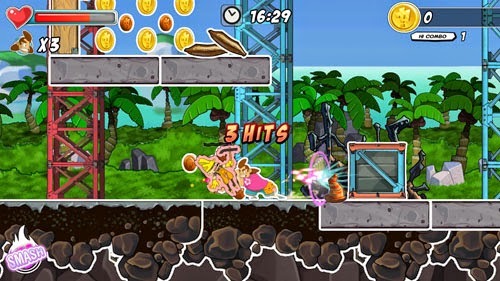 Most of these objects require multiple hits to be destroyed, and some areas feature many of them packed together, further slowing the pace while the player waits to move forward. 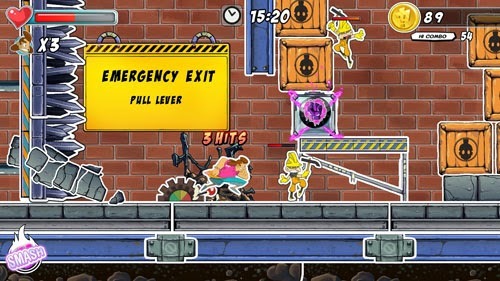 Most of the levels are 10-15 minutes long, and the player starts each level with three lives. There are a number of physical checkpoints spread throughout each level, and getting killed returns you to the most recent one. However, these checkpoints are sometimes spread out over great distances, potentially leading to large chunks of repeated gameplay when the player meets his end. And, if the player loses all of his lives, he must replay the level again from the start, losing any money or stickers he found along the way. This is doubly punishing as the player cannot purchase new moves before making a new attempt. While it’s less common these days, there are plenty of games out there that give the player limited lives and checkpoints as a way of increasing the difficulty level and building tension. What makes this design troublesome in Super Comboman is the ease at which the player is delivered unto his doom. 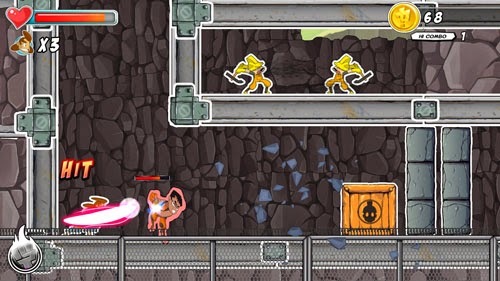 There are numerous levels that feature insta-kill spikes or pits of fire. Sometimes the camera doesn’t even show that there are spikes at the bottom of the room where you’re standing, so the act of simply walking off a ledge may kill you. Some areas feature destructible floors over a pit of spikes, and sometimes killing an enemy will cause the floor to break right where the two of you were standing, causing you to fall into the spikes and die. 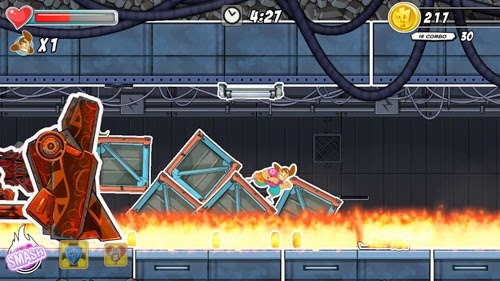 In one area, you must stand on a row of boxes that’s being shoved along by a big bulldozer while enemies drop in from the ceiling, but the boxes are physics-based, so killing an enemy might trip up the boxes and cause them to start rolling over while you fall under them and die in a pit of fire. Sometimes you’re running away from a wall of spikes that chases you through the entire level, and you’ll find yourself stunlocked between two baddies with no way to recover before you’re all killed. Struggles takes a long time to recover between strikes, so getting caught between two enemies is a quick way to see the bulk of your health meter depleted. Since the game takes place on a single plane, there are usually only two directions that enemies come from (left or right), so it’s best to keep your back to the wall wherever you can. Struggles has two abilities that allow him to defend himself. The first is a shield that blocks enemy attacks, but only for a certain time before it disappears. The second comes in the form of a parry maneuver that may be initiated whenever a “? !” icon appears during an attack. By pressing toward an enemy when this icon appears, Struggles will parry his opponent’s move and open an opportunity to attack. However, sometimes the parried enemy just goes right on attacking and you take damage that you can’t avoid. Just as often, you’ll accidentally parry because you’re pressing forward to attack an enemy that’s attempting to attack you at the same time. There are a number of enemies that can drop your health in a hurry, including purple construction workers who toss pickaxes at you from a distance, whittling down your health bar while you wade through enemies to reach them. They even adjust their attacks based on your position, making their projectiles even tougher to avoid. A shop system allows you to make purchases between levels, and these come in two varieties: abilities and perks. Perks act as passive buffs, with items that increase your defense, attack speed, damage output, and more. However, in order to activate these buffs, you have to reach a certain combo count within a level. You can equip two perks at a time, the first of which becomes active when you reach a 30-hit combo, and the second requires a 70-hit combo. While a 30-hit combo is certainly achievable, the level design makes the possibility of a 70-hit combo very slim. The combo is built on a timer, so you are able to take damage and still keep the combo count going, but there are often large sections of the level with no enemies or breakable objects, making it impossible to continue stringing attacks together. When your combo meter is interrupted, your perks are disabled. Some perks appear as temporary upgrades within the environment which are found by breaking specially marked crates that offer a temporary speed up, increased damage, or unlimited use of your heavy attack. 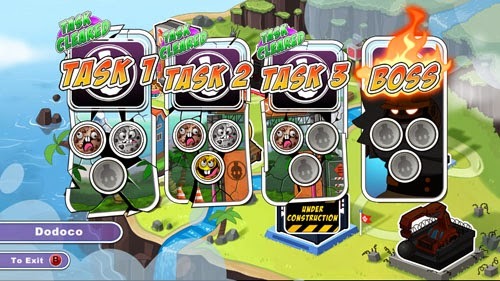 Money may also be spent on new abilities that are assigned to directional movements and the press of the SPECIAL button. These moves include the ability to dash through blocking enemies or the ability to grab and pile drive your foes. A number of Street Fighter moves are purchasable as well, including the DOWN FORWARD SPECIAL combo that launches a fireball, as well as a flaming uppercut and spinning lariat. 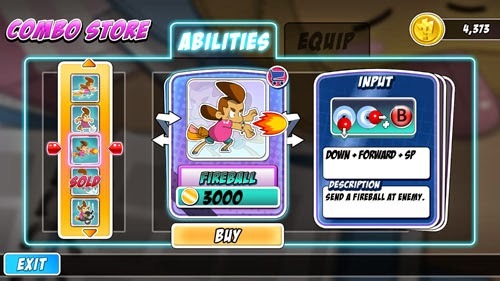 The fireball can be used to cheat a bit and attack enemies who are offscreen – including bosses – and wear down slow-moving enemies or those who stand still. 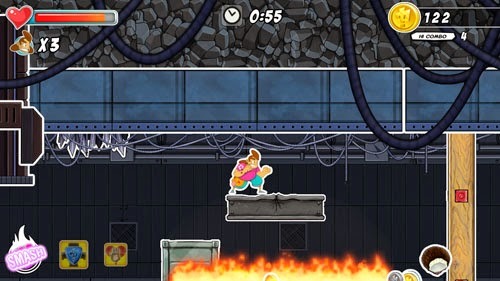 Unfortunately, it’s very easy to initiate a dash while attempting to toss a fireball, potentially dropping you off a ledge in the middle of a flaming toss. One special ability is a charge attack that allows players to hold the SPECIAL button to slowly charge a heavy punch. During this charge period, Struggles squats and his eyes bulge, and a colorful glow appears around him. This glow cycles through three colors as the power of the attack grows. When the glowing circle turns red, the player has a few seconds to let off the button to manually attack before it overloads and Struggles punches on his own. At its highest charge, this attack can be used to knock enemies back across the screen. However, enemies can also interrupt this attack by punching Struggles while it charges. Unfortunately, there is no animation to indicate that his attack has been cancelled – and the glowing circle will continue to change colors – so it appears that the attack is still charging, but when the player lets off the button, nothing happens. The action is occasionally broken up by puzzle sequences where the player must press a series of buttons in order to move forward. Red buttons may be activated directly, whereas purple buttons can only be activated by knocking a wrecking ball into them. Sometimes a button is placed on the other side of an electrical barrier, making it impossible for the player to reach it directly. In these areas, a slow stream of infinitely spawning popcorn enemies is dropped into the room, and the player must use a heavy attack to knock them backward, sending them through the barrier and into the button. Eventually, the buttons are placed behind barriers and around corners, and players must send enemies through the barriers and bouncing off of objects to reach the button. However, the unpredictable physics-based bouncing makes this ordeal an entirely trial and error affair. Each area is made up of a certain number of levels, with most ending in a boss level. In the early going, the boss levels are nearly as long as regular levels, requiring that players fight their way through enemies and obstacles before facing the boss… and doing it all over again if they lose all of their lives. As expected, bosses have huge attacks that can deal a ton of damage, and players must get in some solid hits while blocking or avoiding the strikes of these powerful foes. But sometimes, for no apparent reason and with no accompanying animation, bosses become temporarily invincible. If you get in too many strikes without a retaliatory attack on the part of the boss, he will stop taking damage. From there, it doesn’t matter how many times you attack him, he will not get hurt. After a while, he will let off a couple of attacks and become vulnerable once more… again with no animation or other indication that he is once again able to sustain damage. This is the case in all boss encounters from the start of the game to the end. In one instance, there is a boss with a huge hammer that slowly walks toward you while popcorn enemies occasionally drop in from above. He can only hurt you with his hammer, but he will not attack if you if you are standing in a corner. So, he can just walk over to you, press you into a corner, and then stand there doing nothing while none of your attacks have any effect. You can punch him and kick him like crazy, and purple construction guys will hit him in the back with pickaxes, and he’ll just stand there doing nothing. The only way to move forward is to jump over the boss and into a sea of stunlocking enemies while the boss turns around and wallops you with his hammer. Problematic design choices are further exacerbated by minor glitches that appear throughout the experience, such as a camera that doesn’t always focus on the proper area, doors that don’t always open properly, the possibility of getting locked into an area and forcing a level restart, and occasionally getting locked in an attack animation and finding yourself stuck hanging in midair. 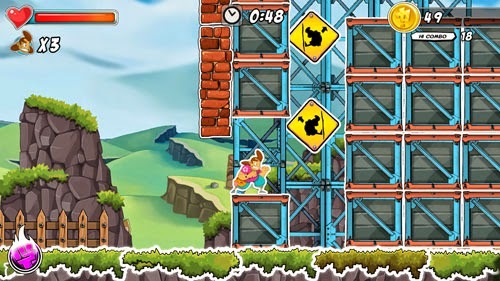 Super Comboman was developed by Interabang Entertainment, which was founded in 2009. The studio previously worked with Cerulean Games on Shinobi Ninja Attacks. The game was funded via Kickstarter and published by Adult Swim Games, which previously published such indie titles as Völgarr the Viking, Fist Puncher, Super House of Dead Ninjas, Oblitus, Westerado: Double Barreled, Rise & Shine, and Rain World.